Were Hollywood to invent a blueprint from which to create the ultimate matinee idol, taking Channing Tatum as a point of inspiration would be the perfect place to start. Handsome, with strong jock features, the actor is pleasing on the eye for the ladies and manages to keep the men onside with game, self-effacing humour. A perfect demonstration of his unique talents comes in the form of a virtuoso comedy performance in 22 Jump Street - his befuddled expressions alone, torn with uncertain anguish over a misunderstanding involving Cate Blanchett, justify the sequel's existence entirely. His double act with Jonah Hill, a tight-wound Ying to Tatum's nonchalant Yang, is a rare big-screen outing worth revisiting - sequels usually inspire wearied resignation, here the duo's infectious love of their characters and terrifically committed performances should raise merriment in all but the most catatonic of hearts. 22 Jump Street, the follow-up to the hugely successful 21 Jump Street, is a movie which is very aware of itself as a sequel - in this respect it shares Muppets Most Wanted's ethos (though, it should be noted, Phil Lord and Christopher Miller's movie manages to raise titters, guffaws and belly laughs in a way that Bobin's feature never quite did). 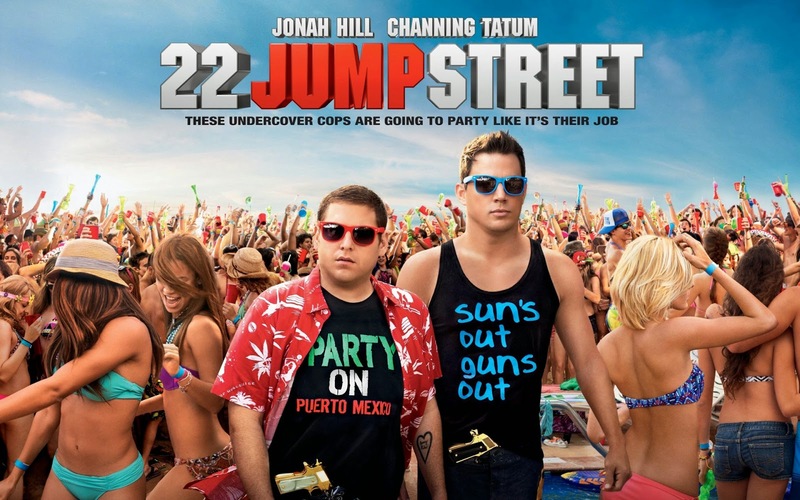 Meta-humour is displayed from the off as the movie satirises lazy Hollywood convention with pin-point precision: Schmidt (Hill) and Jenko (Tatum) are ordered to do exactly the same as in the first film but, instead of the undercover cops attending high school, the pair are asked to infiltrate college to find drug dealers on campus. That the set-up seems so lazy is part of the joke - one at the expense of American movie executives and throngs of audiences who attend churned out sequels en masse each year. Nothing onscreen makes much sense: everyone on campus continually question how old the undercover cops are ("Tell me about the war.... any of them" one unimpressed student deadpans); laughs are raised by questioning a budget inflated "for no reason"; a drug sequence involves the ultra-inspired use of a Creed soundtrack. This post-modern meta-absurdity is part of the on-going joke we are invited in on by Lord and Miller. Schmidt and Jenko, however, don't share in our knowledge, often finding themselves completely oblivious to any humour occurring around them. Were the characters to acknowledge the ludicrous scenarios they find themselves in, the whole facade of the movie would fall apart. Instead, delightfully, Tatum and Hill play everything with admirably straight faces. There's no winking to the camera or desperate gurning to raise titters - the duo instead react to the chaos in the world around them with stoic sincerity. Their earnest proclamations alternate from hilarious ("He's had one class in Human Sexuality, and now he's Harvey Milk") through to the strangely touching (Jenko's watery-eyed assertion that Schmidt raises him up is a thing of beauty). We completely believe in the characters in a manner we may not with the sequels and buddy films 22 Jump Street satirises so successfully. There's no level upon which this movie is not an unmitigated success. Here would be a good point to note that this is the third feature film by co-directing team Phil Lord and Christopher Miller following on from 21 Jump Street and this year's rather excellent The Lego Movie. Whilst it may be Hill and Tatum who take the on-screen plaudits for their camaraderie, chemistry and dedication to dumb laughs, it is the continuation of the film-making duo's on-going partnership which provides one of the main areas of optimism coming out of the movie. Even if Tatum and Hill don't return for a second sequel, something an end credit sequence strongly suggests may not happen, there's another, less conspicuous pair who I'm quite certain will be making audiences laugh for years to come.